Rinse your kale well in cold water. Shake it dry and then dry it with a clean towel. Remove the tough spines from each leaf. Pile the leaves on top of each other and use a sharp knife to slice it as finely as you can. Put it in a large bowl, you'll need about a handful of greens for each serving. Toss the kale with the sunflower seeds, cranberries, and pistachios. Whisk the oil and vinegar together, and season with the salt and pepper. Drizzle enough on the kale to moisten it all, and toss. Refrigerate. Cook the lentils in vegetable or chicken broth, according to the package instructions. Meanwhile heat a grill pan over medium high hear until very hot. Brush the salmon with olive oil and season with salt and pepper. Grill for several minutes on each side, just until barely done in the center. The time will vary according to how thick your fish is. Brush the yellow pepper with oil and put it in the grill as well, turning it to get charred on all sides. Slice the salmon into four pieces. Halve the pepper, remove the ribs and seeds, and slice into thin strips. 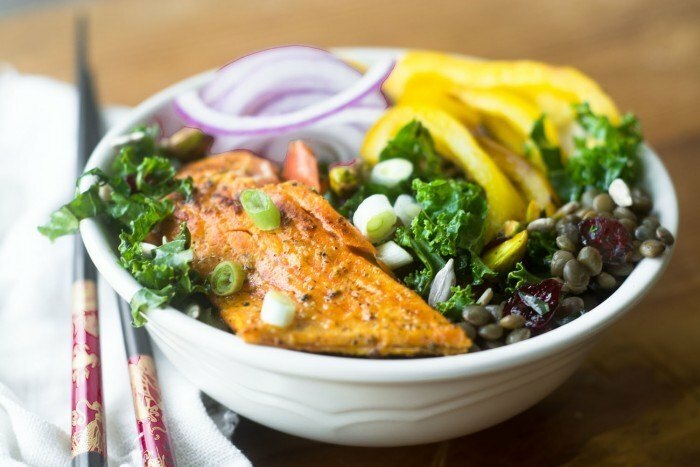 Put a handful of the kale salad into each of four bowls. Add a good amount of the warm lentils on top. Arrange the salmon, pepper strips, and red onions around the top.